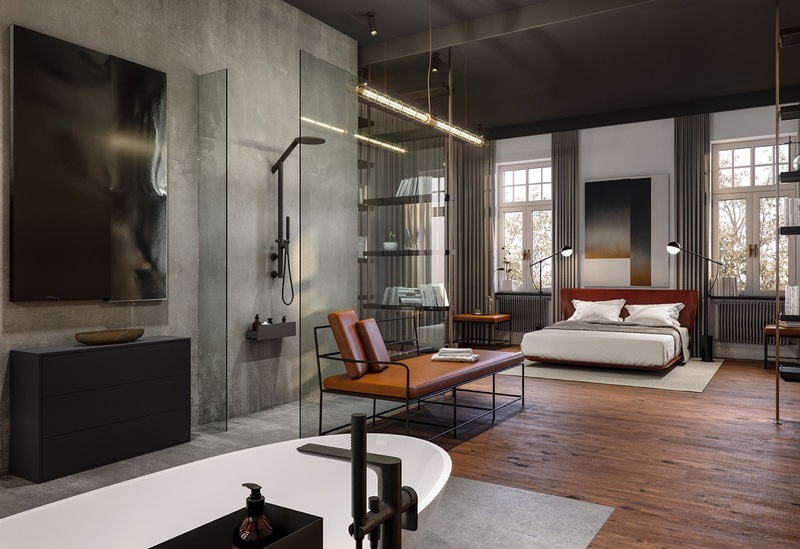 Two similar style homes await our perusal here, each with an industrial style vibe that is steeped in sophistication. 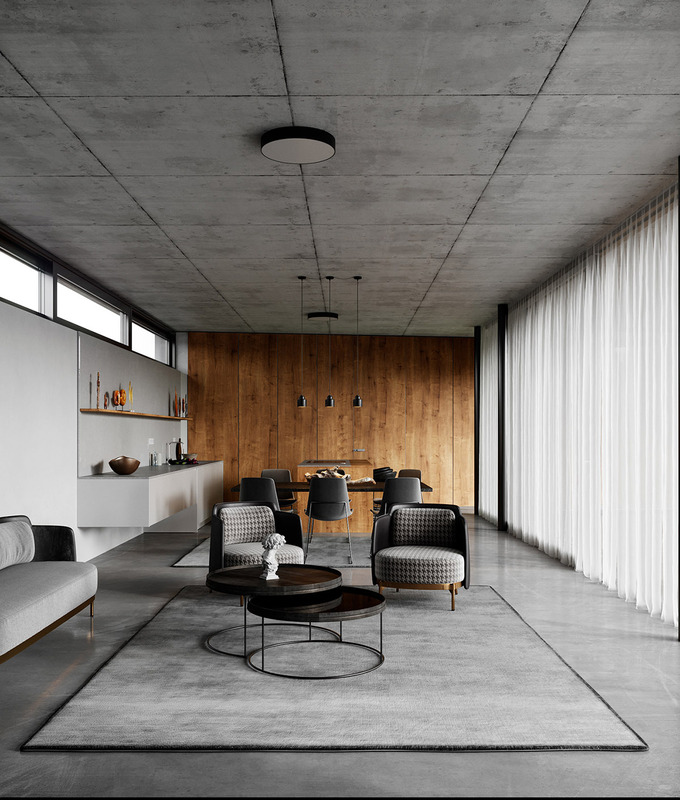 Raw concrete walls and ceilings, cracked and crazed do not typically evoke a vision of luxury living. 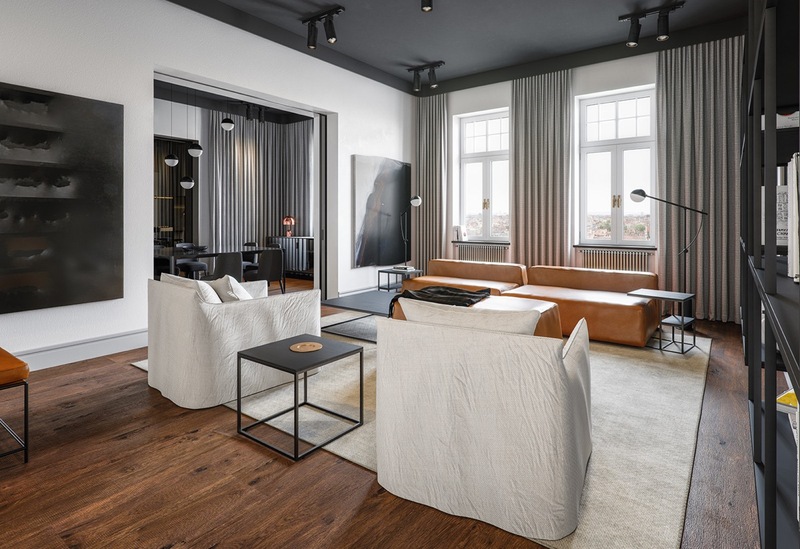 However, take a moment to absorb the interior designs of these two apartments that incorporate high-end furniture design, modern art and beautiful lighting solutions to create top notch living spaces in exactly those surroundings. 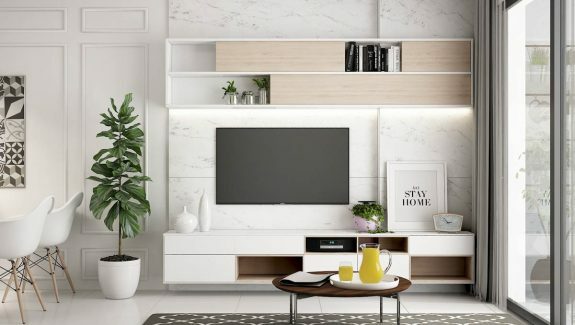 The industrial space is simply a blank canvas that has been layered upon and added to, it does not define nor limit the quality or comfort of the pieces put inside it. 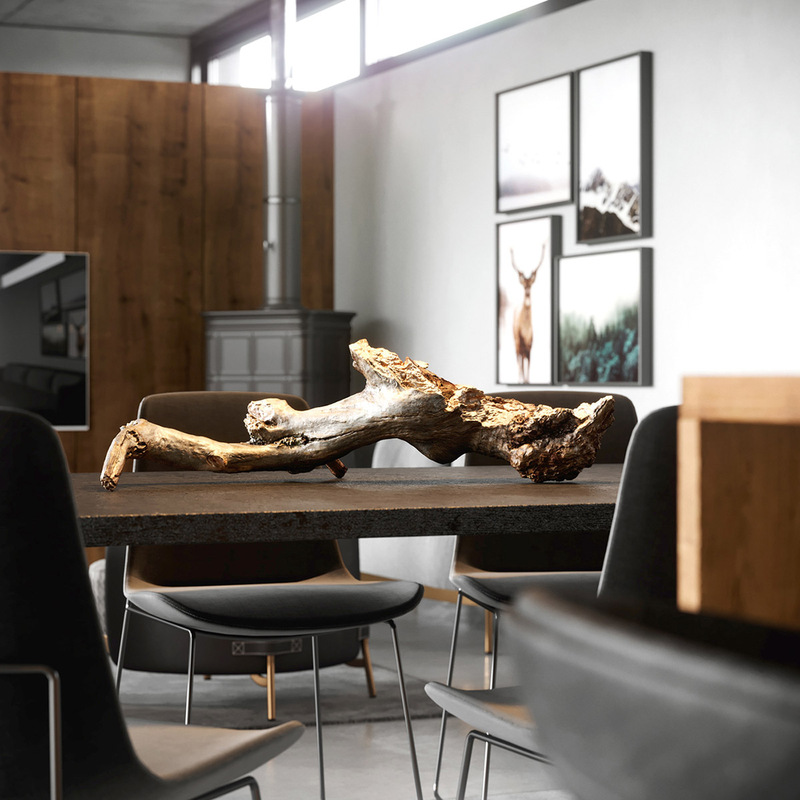 See how these two designs each warm and smooth cool, rough industrial space. Our first visit is to a 300 square metre home, in a beautiful tenement house in Warsaw. 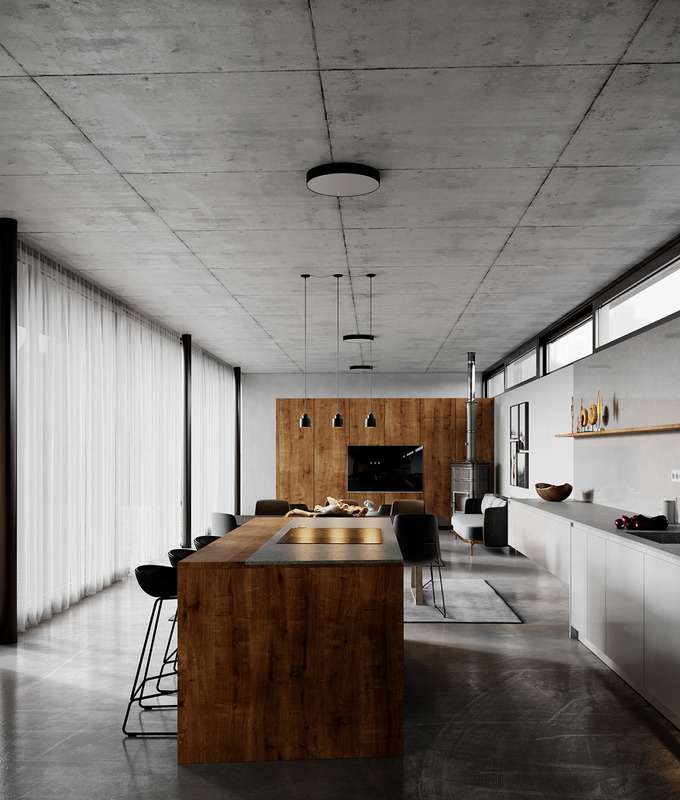 A laid back approach is taken in this dry, sophisticated interior. This is a scene set in the wabi-sabi design ethos of how beauty stems from imperfections – like meandering cracks in exposed concrete walls. 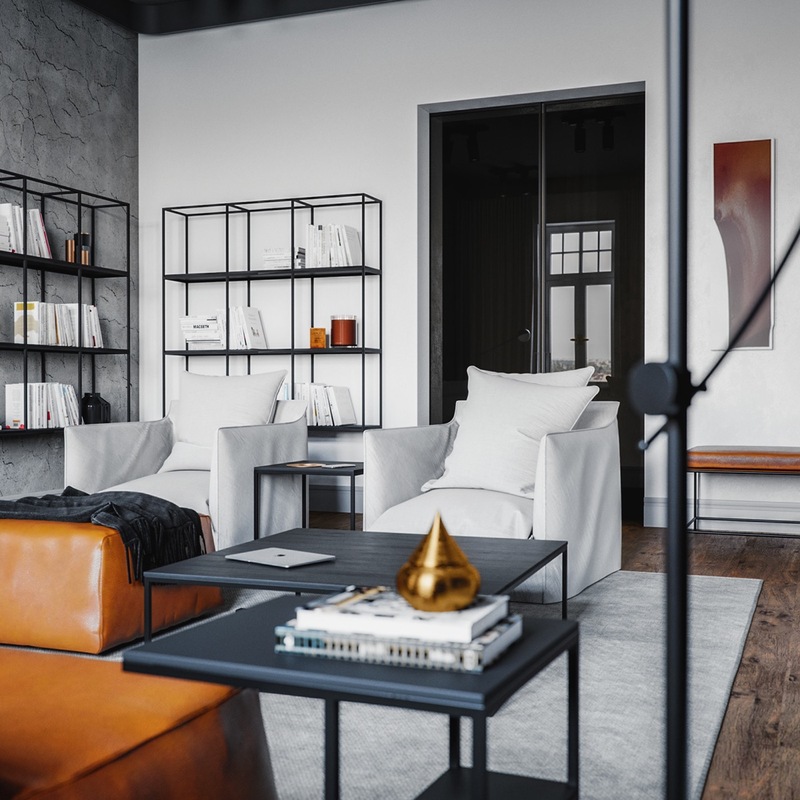 This home has a no-nonsense industrial vibe, but it is filled with high quality design and modern Polish art. 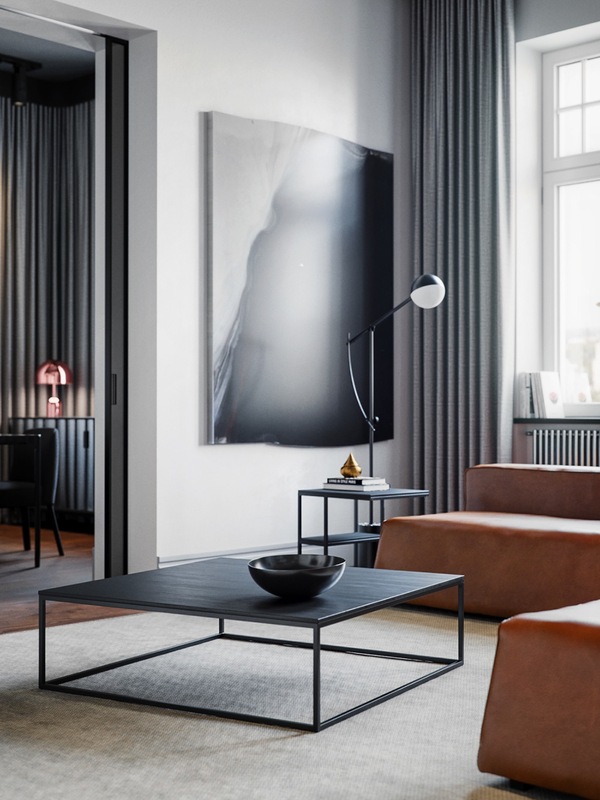 An orange tan leather sofa draws from colour in the wall art and warms the very grey living room. 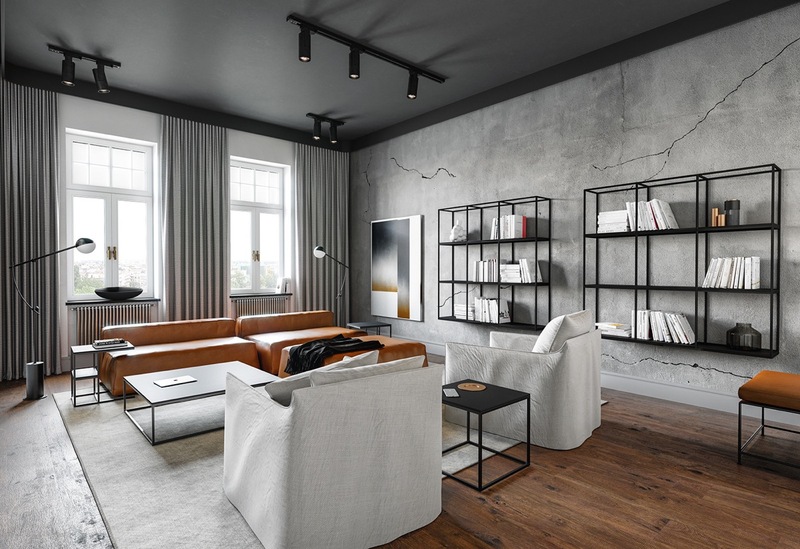 Black accents break up the pale grey mass in the form of wall shelves, side tables and floor lamps. 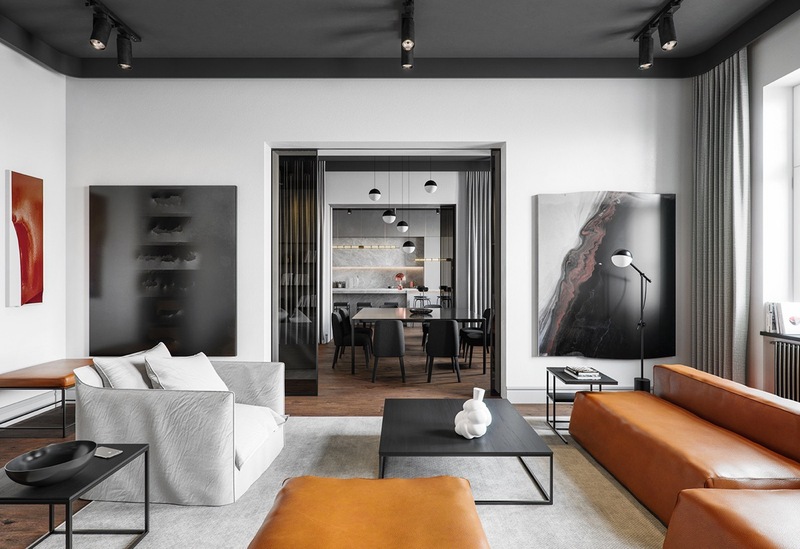 More of the abstract art collection fills smooth white walls on the opposite side of the room, where a smoked glass doorway opens up to a dining room and kitchen. Another set of smoked glass doors close off the other side of the room, behind two cosy slouch armchairs and an orange tan leather pouffe. 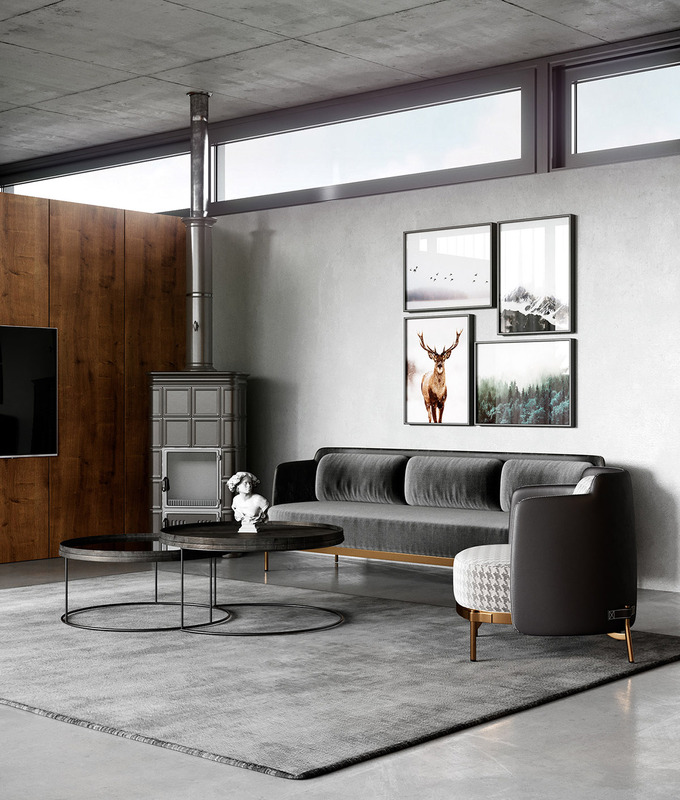 Black metal side tables serve the armchairs and the leather couch. 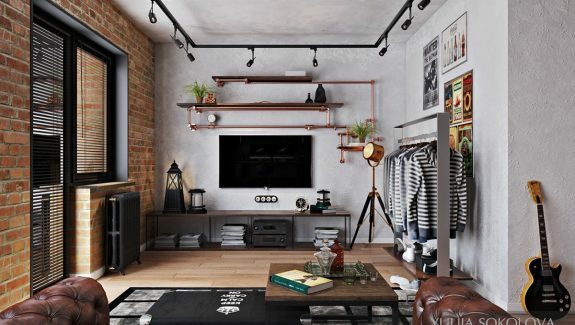 Black metal frame wall shelves match the look of the side tables dotted around the room. 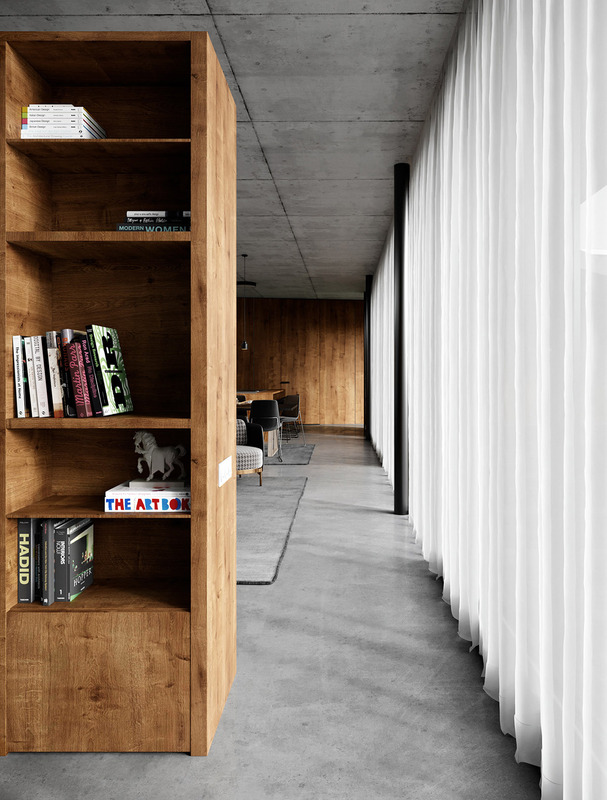 The series of wall shelves hold a library of books and decorative items. 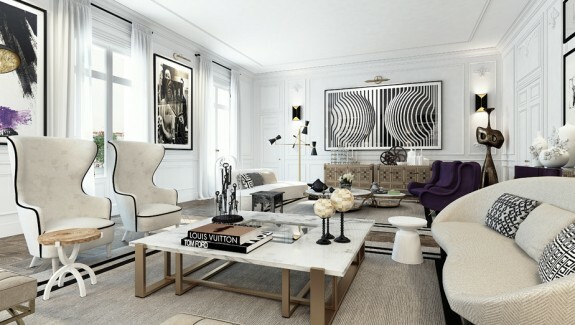 A black modern coffee table marks the centre of the space. A cluster of globe dining room pendant lights dangle over a back dining table and chairs set. 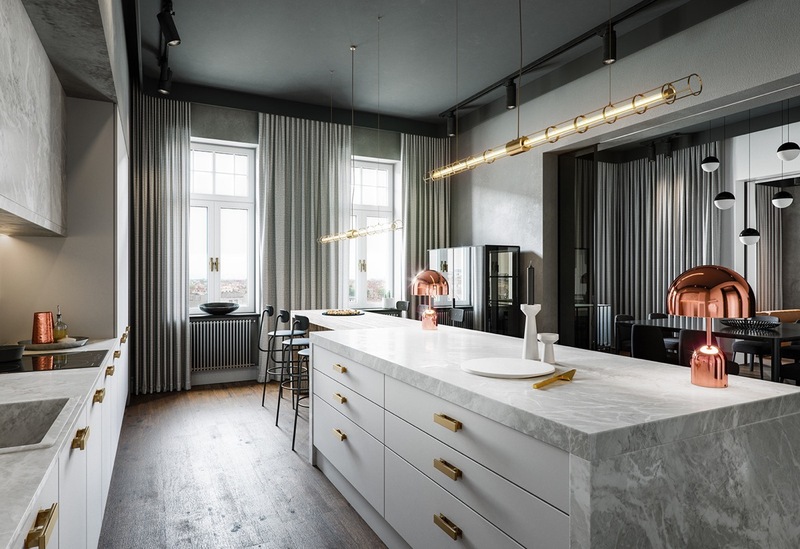 An enormous kitchen island is illuminated by industrial style lighting with gold accents. 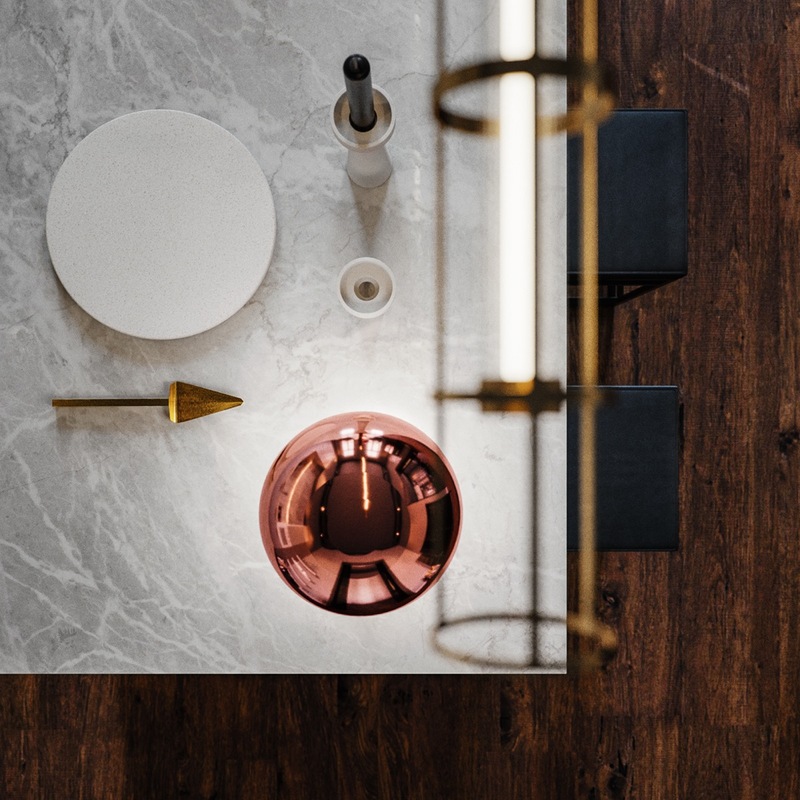 The rose gold designer table lamp seen here are the Bell lamps by Tom Dixon. If you love these rose gold/copper accent lamps don’t forget to check out: 36 Cool Copper Table Lamps To Warm Up Your Interior. The kitchen island looks out to the dining room, through tinted glass sliding doors. The marble effect kitchen island seats three casual diners, but runs directly into a dining bar with six more seats. The pale kitchen countertop has an integrated sink, which has been boldly accessorised with a matte black faucet. A cognac colour floor enriches the scheme. 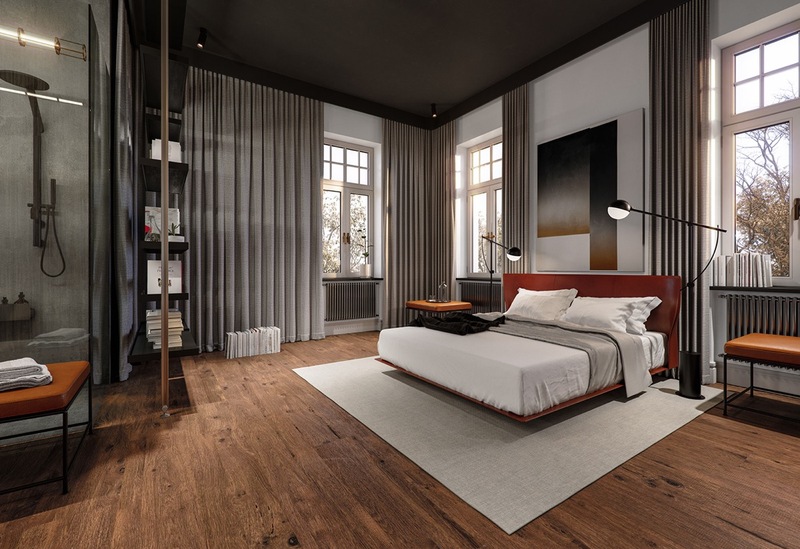 Warm earthy tones return in the master bedroom suite, where a ruddy coloured bed rests between two floor lamps. 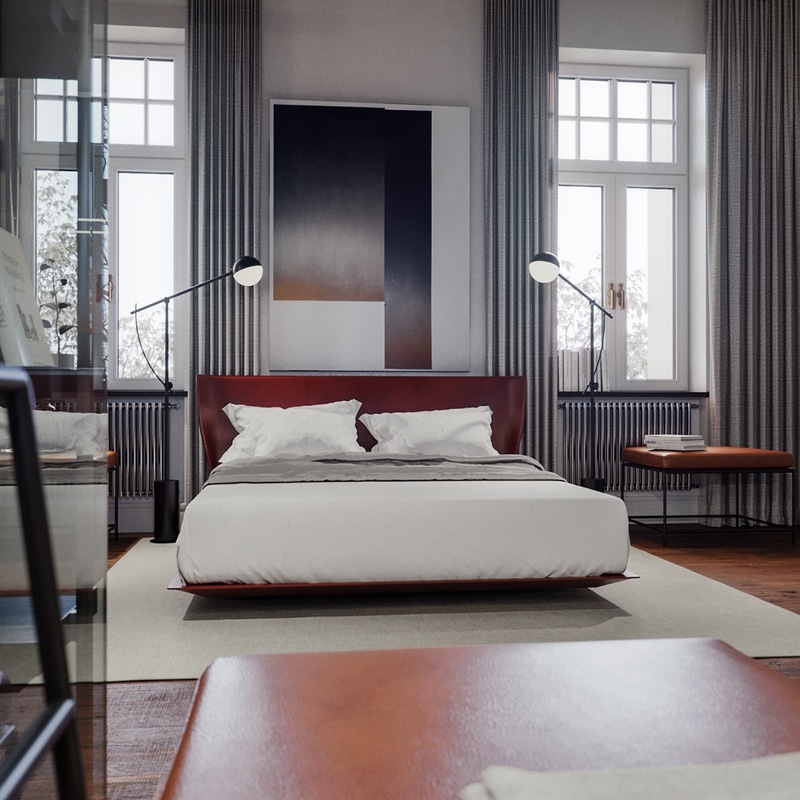 The platform bed is flanked by orange tan leather bedside benches. 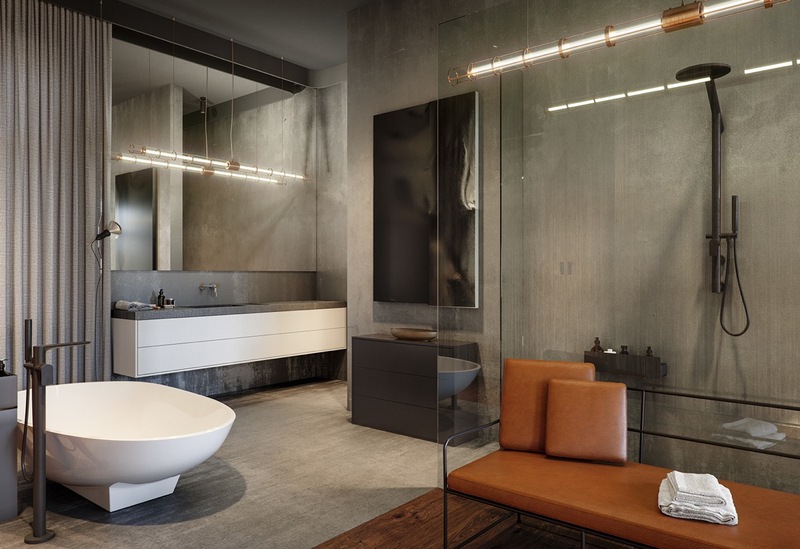 An open bathroom design adjoins with the master bed. 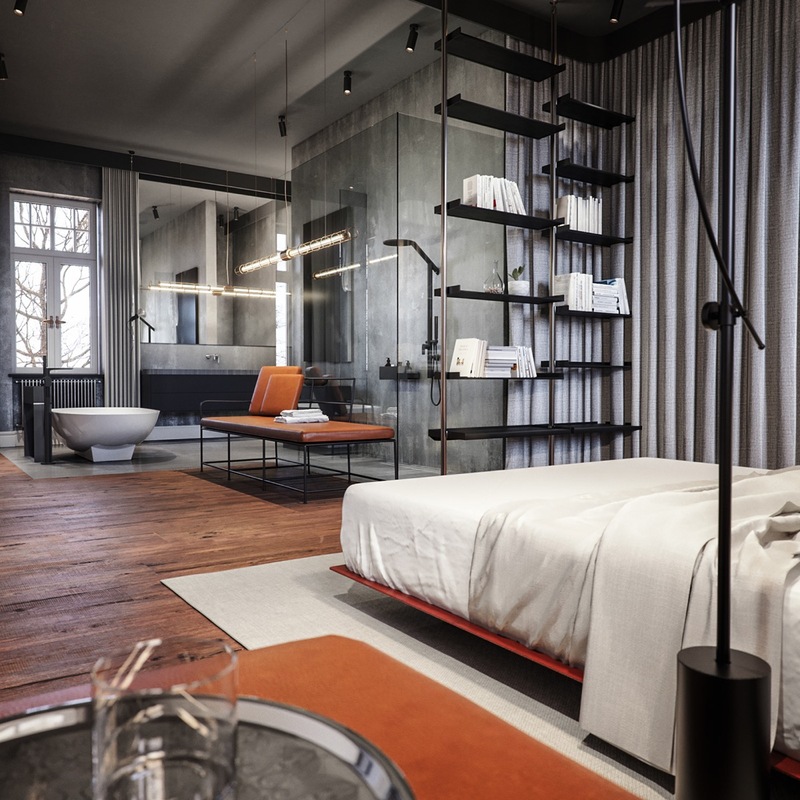 Industrial style shelving acts as a subtle room divider between the sleep space and a glass shower cubicle. 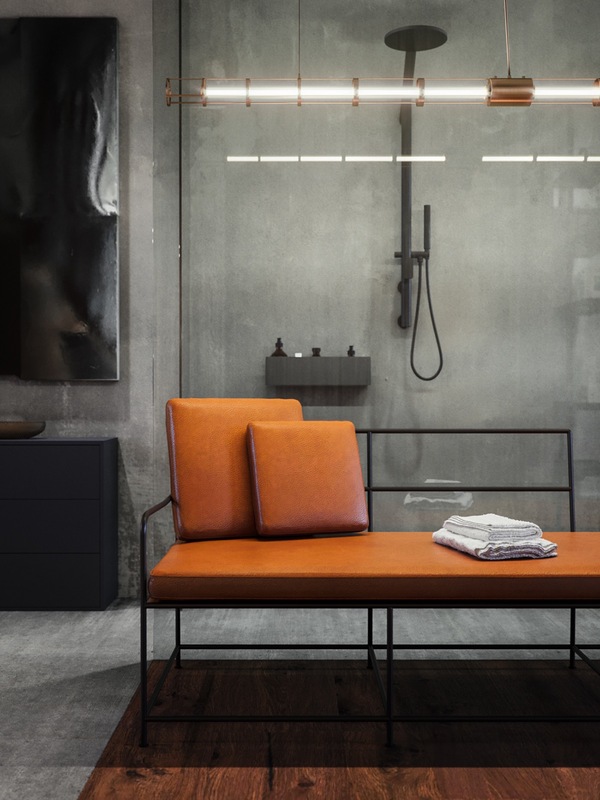 An orange tan leather bench spans the transition space to the wash zone, offering a spot to set down clean towels. A concrete topped vanity unit is wall mounted to continue the open spacious look. The second of our two sophisticated industrial home tours welcomes us in with plush seating and a gallery of serene nature prints. A love of nature and its intriguing beauty runs throughout the scheme. 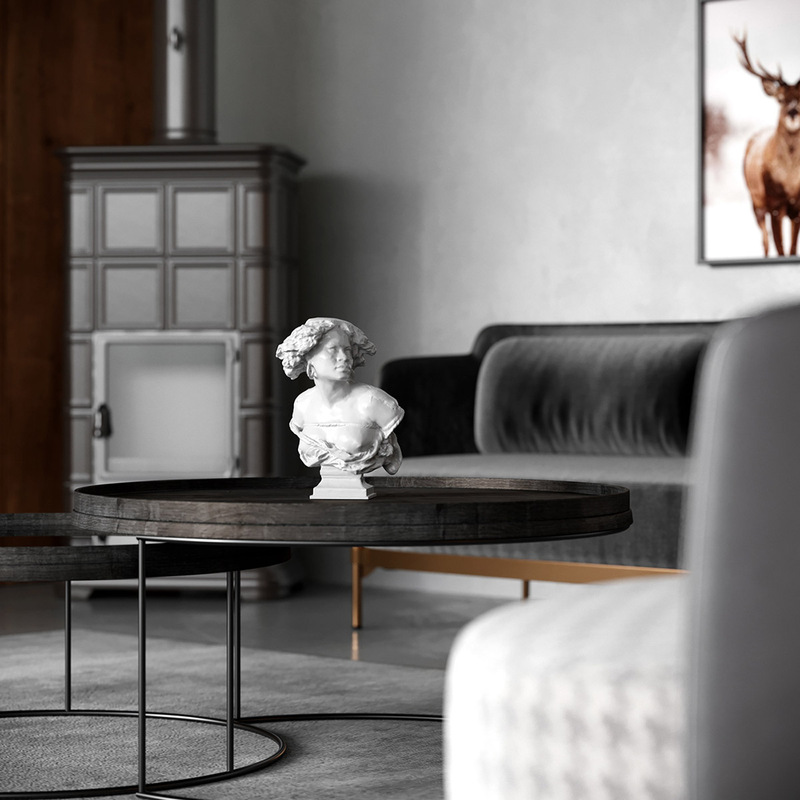 A sculpture adorns one of the round coffee tables at the centre of the elegant lounge space. The set of nesting coffee tables sits upon a smooth grey area rug that defines the lounge area from a neighbouring dining room. Six modern dining chairs surround a black and wood dining table, on top of a second grey area rug. 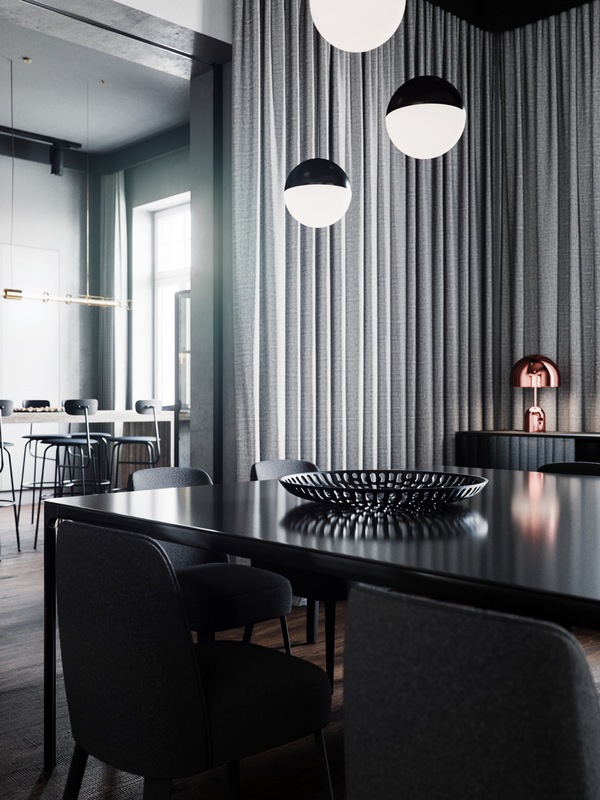 The carpeted dining area rests beneath a trio of black dining room pendant lights. A wall mounted white sideboard runs the length of the dining room before morphing with white kitchen base units at the far end. One solitary wooden display shelf follows along the same length of wall, displaying a restrained collection of decorative items that are inspired by nature. A piece of driftwood is utilised as a table centrepiece. 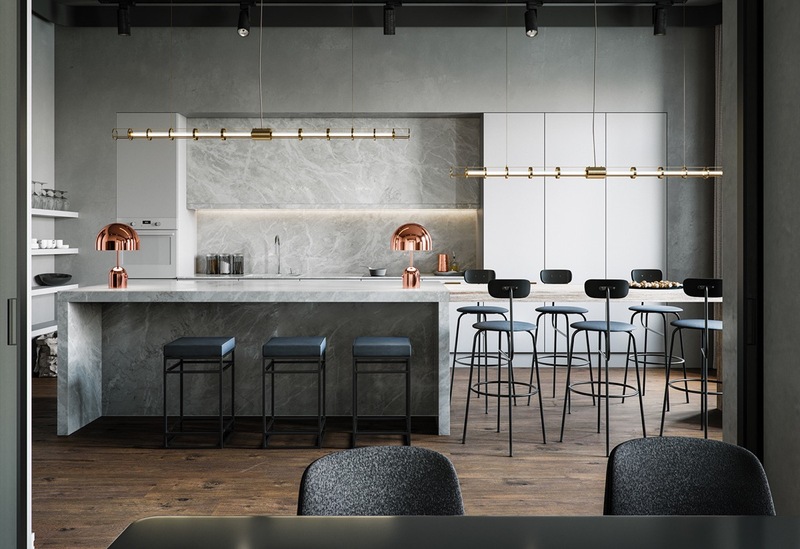 The modern kitchen has a central island for prep, cooking and casual dining. 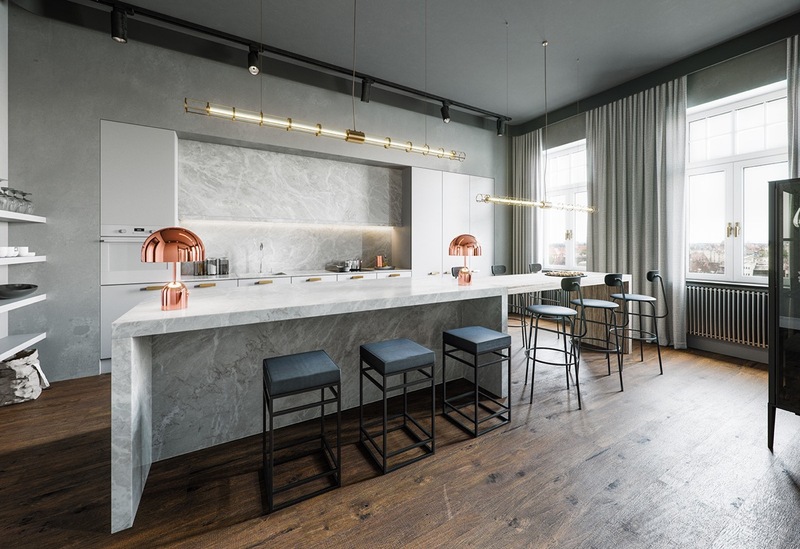 Three black kitchen bar stools line up along one side of the kitchen island, opposite a ceramic cooking hob. 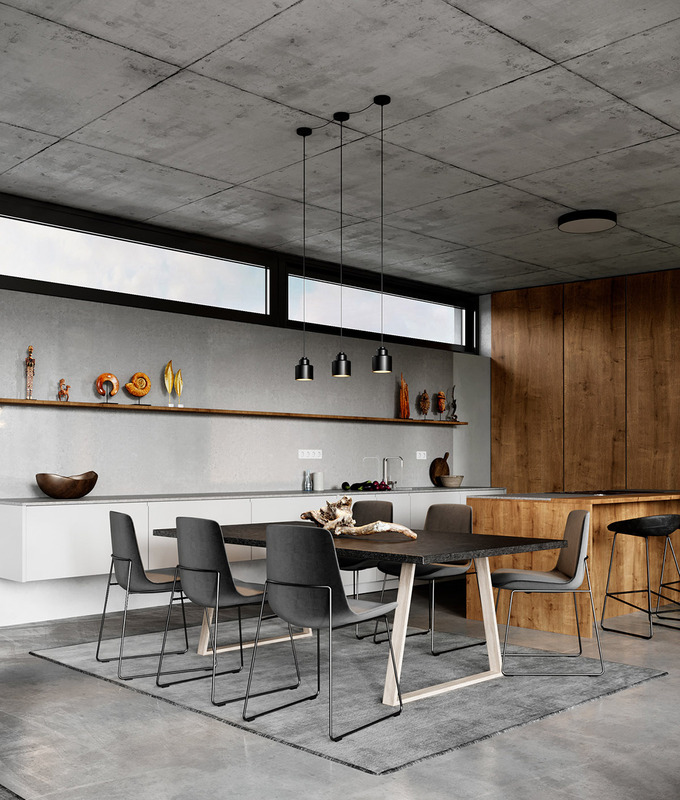 The central island is a wooden volume, which matches with the long decorative wall shelf over the kitchen units situated behind it. 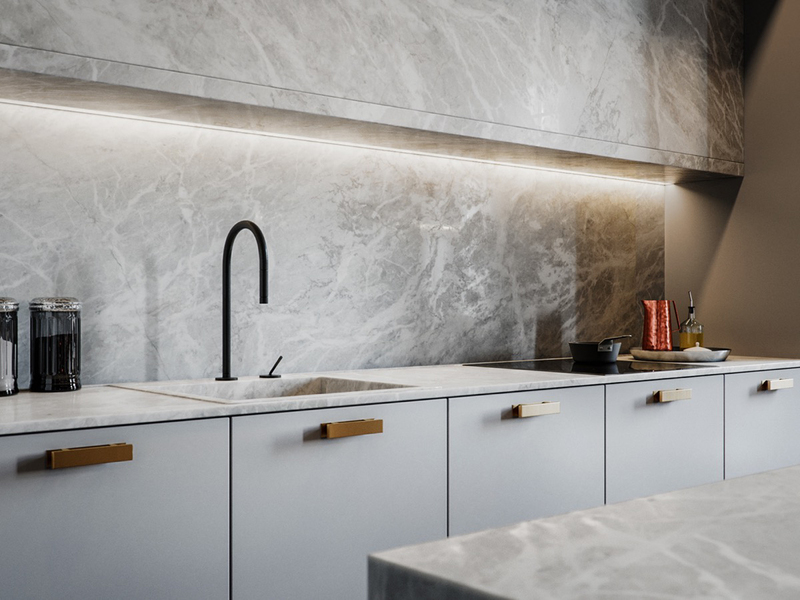 However, the countertop around the cooking hob is covered with a thin slab of cool concrete. 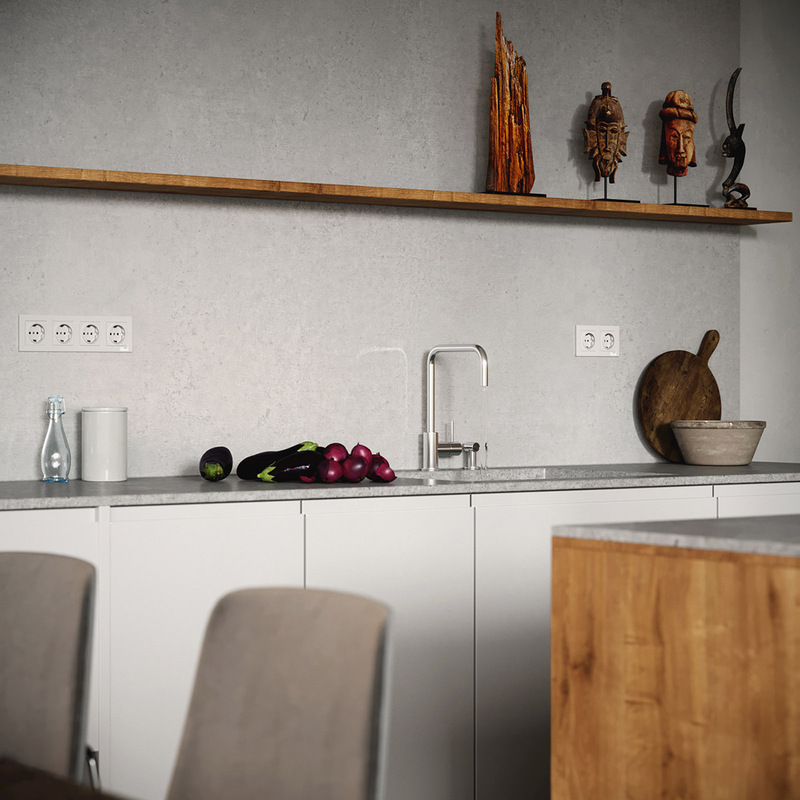 The kitchen countertop is kept completely uncluttered in a minimalist fashion. 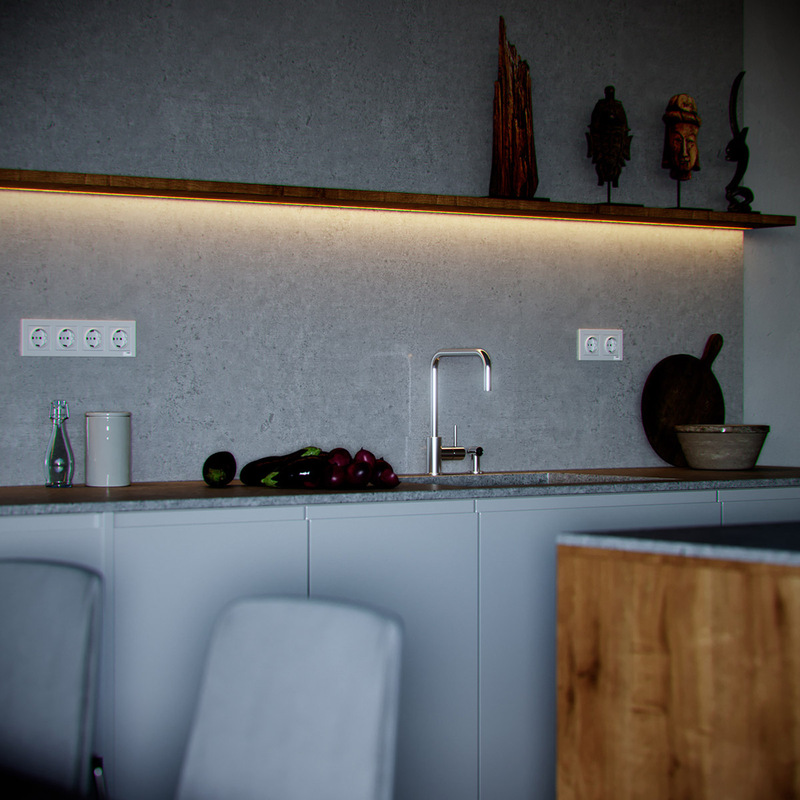 A hidden LED strip runs the length of the wooden wall shelf, to cast a soft glow onto the kitchen backsplash and countertop below. 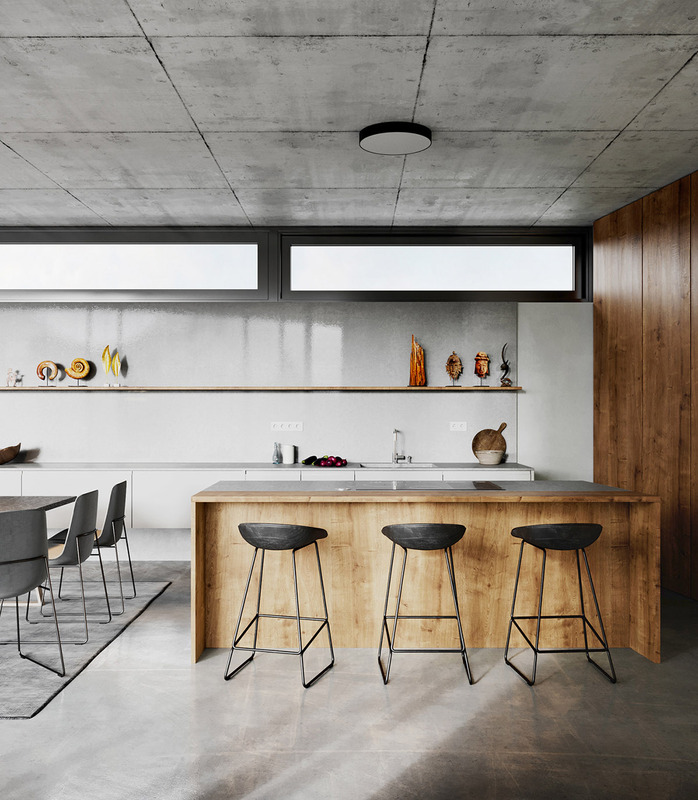 The kitchen worktop is polished concrete. 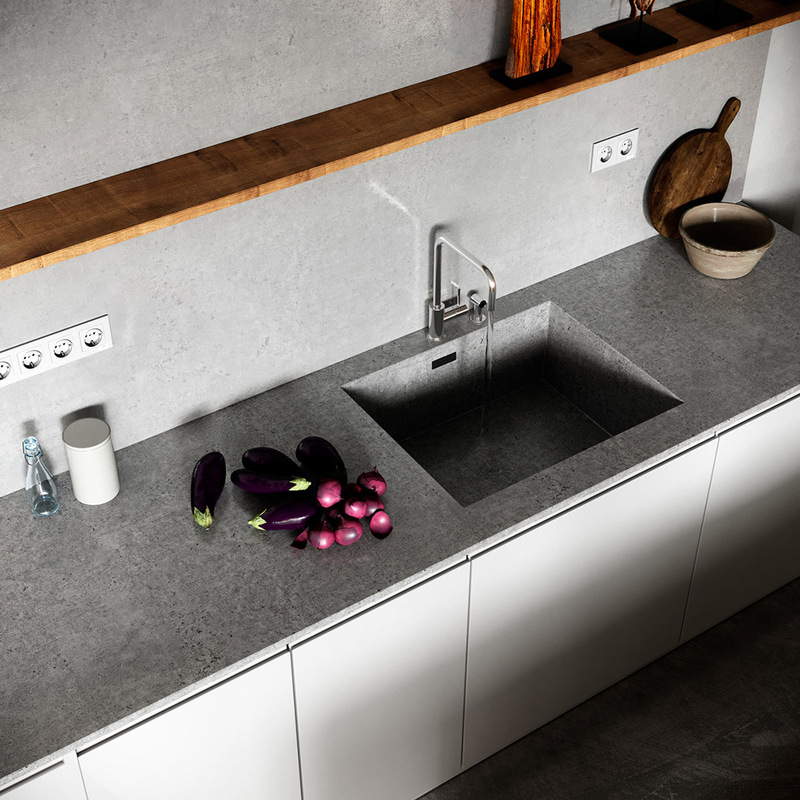 An integrated concrete sink is filled by a chrome modern kitchen tap. 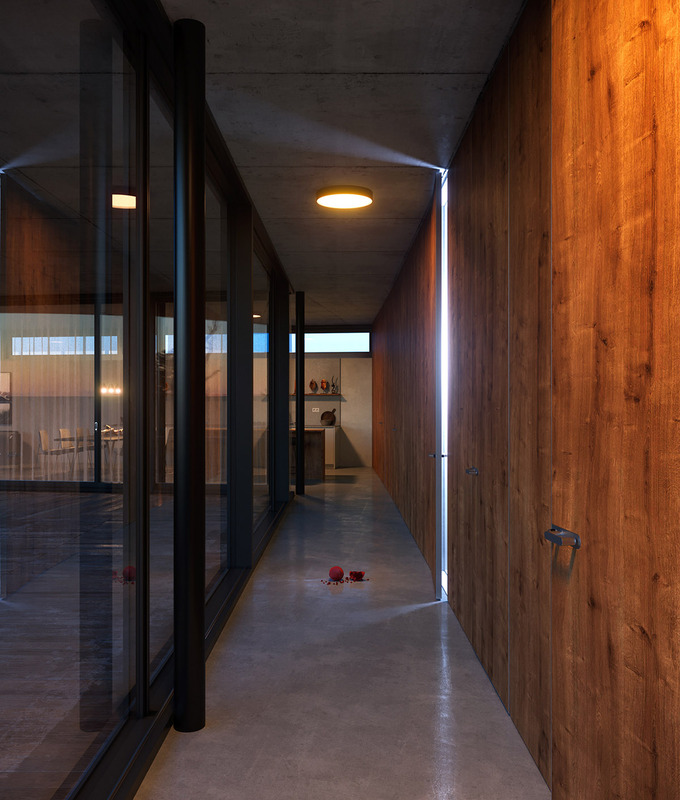 A long expanse of glass doors flank a wood and concrete hallway. 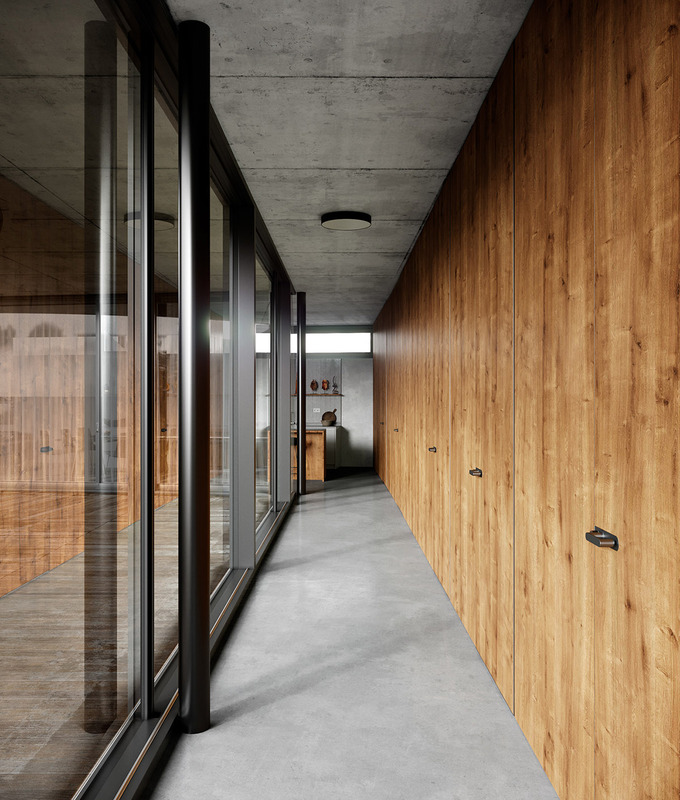 Wooden interior doors are camouflaged in the wood wall panelling that spans the length of the hallway. 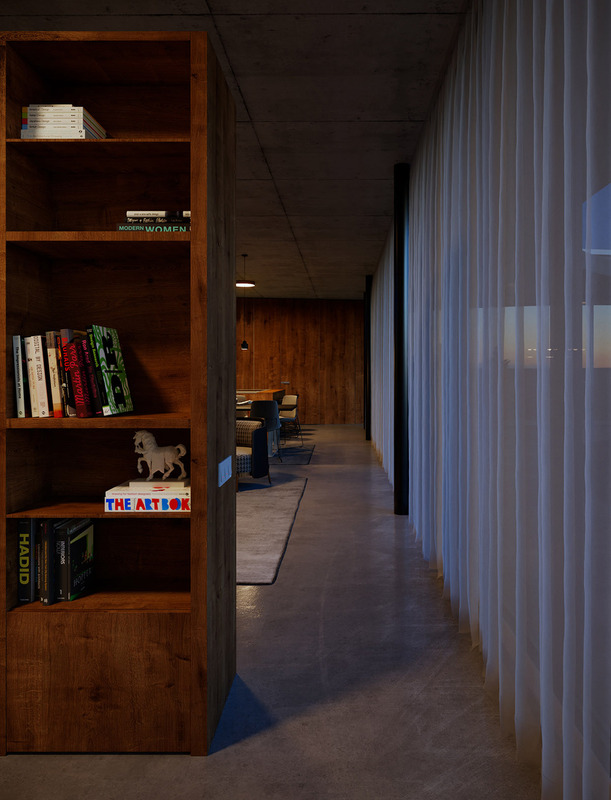 Chunky wooden storage volumes match with the wood wall panelling in the main living area. The shelves hold a small home library and a few ornaments. 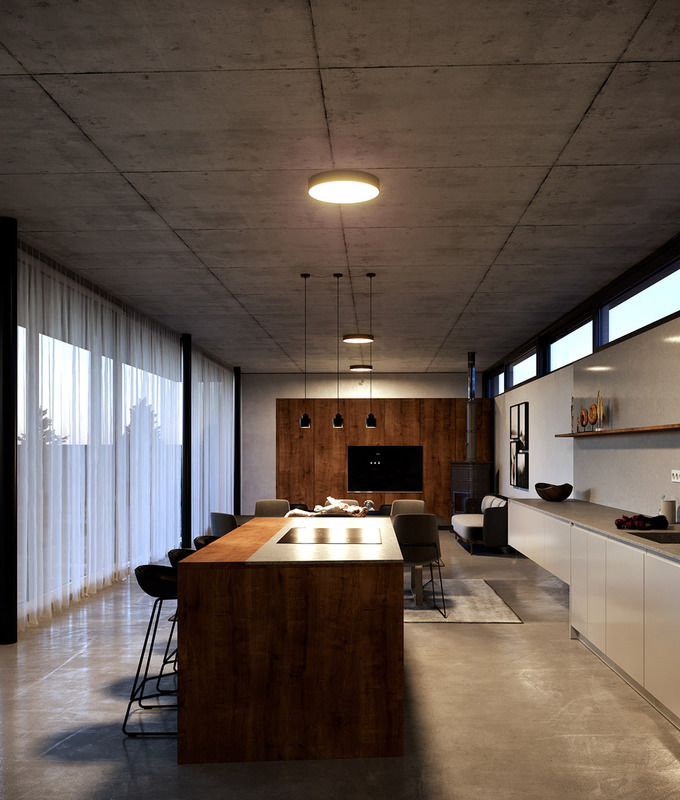 By night, wood tone becomes rich in the shadows, whilst polished concrete reflects the artificial glow.